At Wilberforce, the fine arts are an essential part of a reflective life. Our students learn to appreciate and create art in all its forms as they take each of these core curriculum classes. We honor God as creator of all beauty and acknowledge ourselves to be creators in His image. As part of learning how to create art, students imitate classical artwork - its techniques, media, skills, and forms. Whether painting, sculpting, viewing, or studying art history, our students strive to achieve artistic excellence and to find a feast for mind and heart in creative expression. Music is a gift from God, and a way to praise God. The goal of our music instruction is for our students to appreciate and create beautiful music. 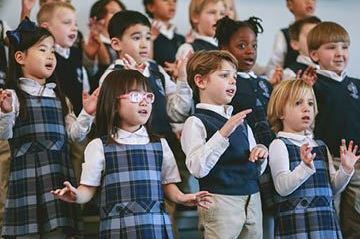 Students discover the joys of choral performance, musical composition, and music history. 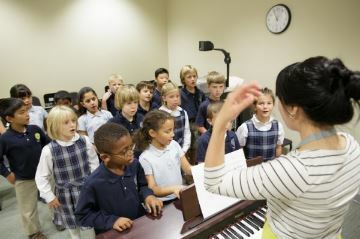 From Kodaly solfege to ensemble presentations, from Gregorian chant to musical theatre, from folk songs to guitar chords, our students learn to listen, analyze, perform, and compose. The fine arts are an essential part of a reflective life, and drama allows students to put themselves into other times and situations, to understand motives and assess reactions. Drama also provides great opportunities for building community, problem solving, meeting deadlines, developing skills in speaking, costume design, set making, technology, and marketing. Starting with skits and antiphonal recitations, moving through short plays in Lower School, presenting musicals which include both Middle and Upper School students, Class Seven Shakepearience and Class Eight declamations, and culminating with the plays our Junior and Senior classes perform each year—drama is essential to the Wilberforce education. In December 2018, the Dramatic Theatre students of Class 11 will present Shakespeare's Hamlet. The spring 2019 musical is Fiddler On The Roof. In May 2019, our graduating senior will present Thornton Wilder's Our Town.